Once upon a time, horror TV movies starred the likes of Scott Glenn and Yvette Mimieux. And that simple fact makes me uncommonly and indescribably happy. The disco decade no doubt represents the golden age of made-for-television movies, and today I want to shine a spotlight on two of my favorite TV productions (since I already wrote about one of the best, John Newland's Don't Be Afraid of the Dark). The first classic is titled Gargoyles and stars Cornel Wilde, Jennifer Salt and Scott Glenn. Directed by B.W.L. Norton and written by Stephen and Elinor Karpf, this "terrifying tale" finds anthropologist Dr. Mercer Boley (Wilde) and comely daughter Diana (Salt) heading out to the desert to interview an old nut named Willie who claims to own physical evidence of demons on Earth. Turns out he ain't kidding: he's discovered a 500-year old Gargoyle skeleton. Worse, the Gargoyles "hatch" every five hundred years and it turns out they're waking up right now (ergh, in 1973!). The Gargoyles, led by Bernie Casey, capture Diana from her motel room one night and now plan to take over the world, unless the local police, Boley and a dirt-biker (Scott Glenn) can save the day. 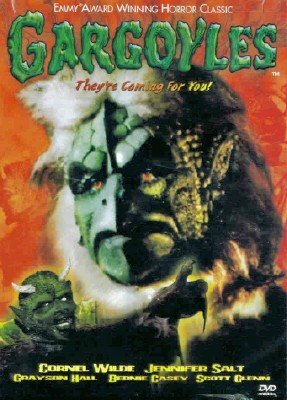 Gargoyles boasts terrific 1970s era monster suits and make-up from Stan Winston and Ellis Burman Jr., and many of the scenes are horrific in a cheesy, 1970s way. For instance, all of the gargoyle scenes are lensed in slow-motion photography, which makes the demons seem much more menacing, and it looks to me like the James Cameron movie Aliens cribbed Gargoyles' final scene, set in an egg hatchery. What remains most impressive about the TV film, however, is the initial half-hour wherein Boley and Diana drive their station wagon through the desert and director Norton stages a number of impressive high-angle shots from a mountaintop that reveal their isolation, as well as the idea that the duo is being watched. The initial Gargoyle attack on Willie's barn, and a follow-up assault set in a small, authentically-seedy motel room, simultaneously impresses and scares. Gargoyles even has some dramatic punch in the thematic zone, with the Gargoyles representing a kind of disenfranchised, despised minority living in the Southwest. Talk about your immigration problems! 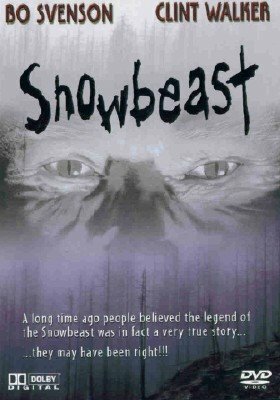 Directed by Herb Wallerstein and written by Joe Stefano and Roger Patterson, Snowbeast plays like a cheapjack version of Jaws, but never fails to entertain, and truth be told, remains a bit frightening, or at the very least - unnerving. There's some great skiing footage on snow slopes, and I love how the film adopts the overutilized P.O.V. again during the climax, only this time with the beast (cameraman...) impaled on a ski stick. That's just great stuff. Both of these films are made without tact; without decorum, and are totally blunt. For some reason, Hollywood has stopped making great made-for-TV horror movies like Don't Be Afraid of the Dark, Gargoyles and Snowbeast. I also enjoyed some eighties examples of the genre (like Wes Craven's Chiller and Invitation to Hell...starring Susan Lucci) but I can't remember the last really good genre made-for-TV movie in this century. Can you? Snowbeast fan here says "RAAAAAAAAARRRRRGH!!!!!" I always loved that name...and I just got this 70s classic on dvd. Spooky that I well can remember the night aia first saw it. I was in my first year of high school. Love the scene where the "Snow Queen" gets a big eyeful of the lustful beast thru the window of the local high school during her big coronation event, which Snowbeast wreaks havoc with. Her mom gets attacked and messed up pretty bad, and our poor Snow Queen comes screaming out to witness the mess...her big night is really ruined, you know!!! toungue-in-cheek affection for this little opus, and he didn't seem to mind! Both movies kind of rule the known universe! I have a real big soft spot for this sub-genre (see my blog for proof!). I find that as a child most theatrical horror films were too much for me but I must have loved scary movies enough because I sought them out on television and stuff like Trilogy of Terror and Don't Be Afraid of the Dark left indelible images in my head. There are some great underrated television movies out there. Recently I re-watched The Stranger Within with Barbara Eden. Yeah, it might not be quite as awesome as Dark Night of the Scarecrow, but it's a legitimately scary film that relies on suspense over visual effects. That's why I love these movies. They kind of were more creative because they had less to work with. Btw, have you seen This House Possessed? Quite possibly the Best. Movie. Ever.